The Ceremony of the Joust: Courtesy or Carnage? Historic Equitation Ltd was created and is managed by Dominic Sewell. Now based in Northamptonshire, Dominic keeps eleven horses that he trains and schools according to classical methods. As a young boy growing up in the historic town of Barnard Castle, Dominic was fascinated by knights and war horses. He never grew out of this love for the medieval period, so in 1996 with other like-minded individuals, ‘Destrier’ was formed. 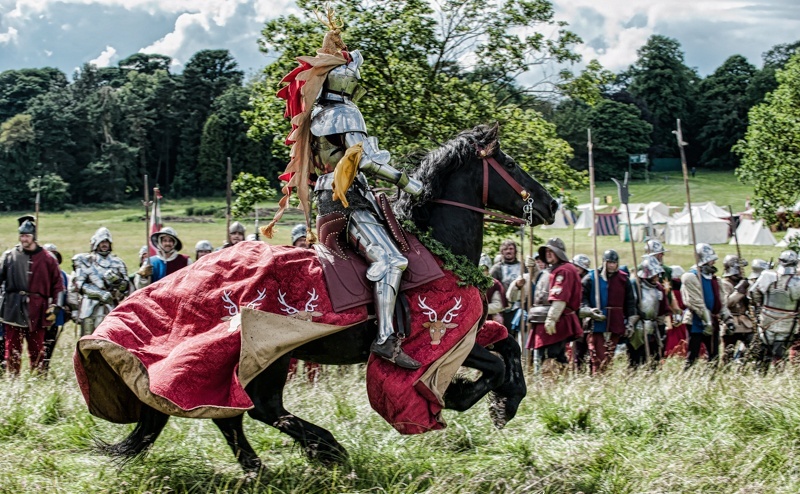 Based in England, Destrier is Europe’s foremost Calvary re-enactment group. After being encouraged by TV star Mike Loades in 2000 Dominic has gone on to joust internationally with his most recent trip to St Ives (Australia) to participate in the 2017 World Jousting Championship. He is currently considered one of the top exponents of the sport. Dominic’s interest extends far beyond jousting and mounted combat, he is a passionate student of historical haute école horsemanship of the Sixteenth, Seventeenth and Eighteenth Centuries. Dominic has been working alongside English Heritage in a project to showcase the classical teaching methods used by William Cavendish, Duke of Newcastle, England’s most famous riding master in his riding house at Bolsover Castle.